Shetland has been identified as the optimal location for an "ultra deep water" decommissioning port. 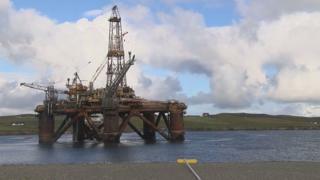 The announcement was made as industry figures gathered on Shetland for an Oil anhd Gas Authority event. Energy Minister Paul Wheelhouse said: "I believe investment in a deep water port will unlock the potential for Scotland to secure the largest decommissioning contracts." The feasibility study was carried out by Ernst and Young. Mr Wheelhouse explained: "A deep water port in Scotland will bring significant benefits not only for a single location, but as a key part of an integrated and networked Scotland-wide decommissioning offering, with wider opportunities realised through the supply chain. "We will continue to engage with industry to measure expected demand and to ensure that investment in a deep water facility will bring the widest possible economic benefit and most substantive boost to the decommissioning supply chain in Scotland." Sandra Laurenson, chief executive of Lerwick Port Authority, said: "Official identification of Dales Voe in a nationwide feasibility study as the optimal location for the UK's ultra deep-water decommissioning facility is a welcome endorsement of our belief that this is an excellent future opportunity for Shetland."